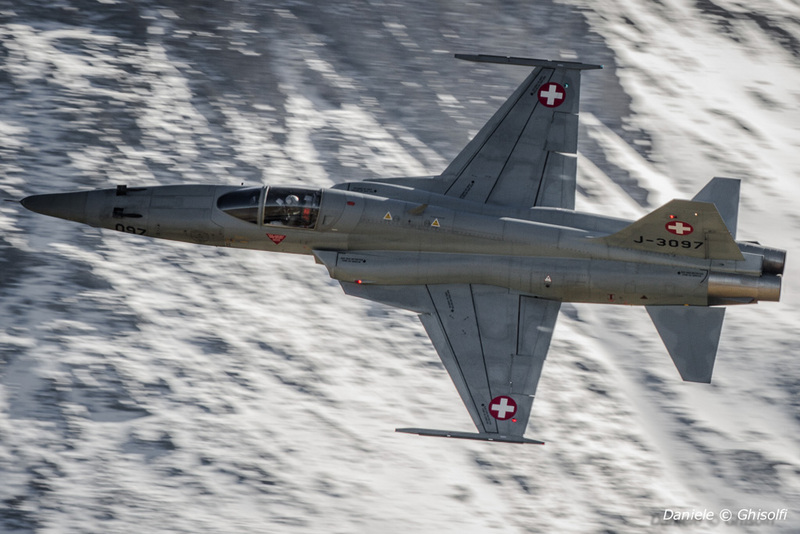 Amazing, this is the first word that can resume my experience at Axalp 2017, the live fire event organized from the Swiss Air force, which this year was the 75° anniversary from the first edition, that take place between the mountains surrounding the lake of Brienz, into Oberland region. 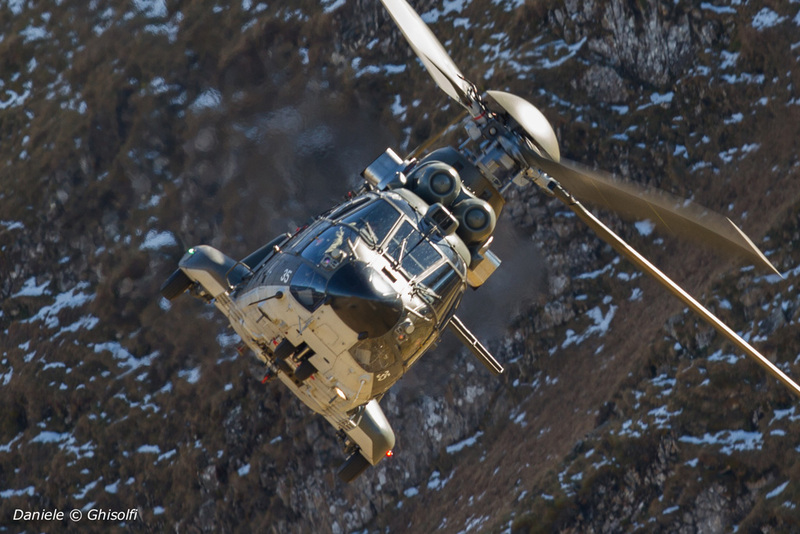 Amazing for different reasons, the landscape with snowy mountains over 3000 m, springtime weather with temperatures that made the wait pleasant, the fly on board of one Super Puma helicopter and the eco between the valley of the bullets shots by F/A-18C Hornet from Fliegerstaffel 11 «Tigers» and F-5E Tiger II from squadron 8 “Vandalos”. 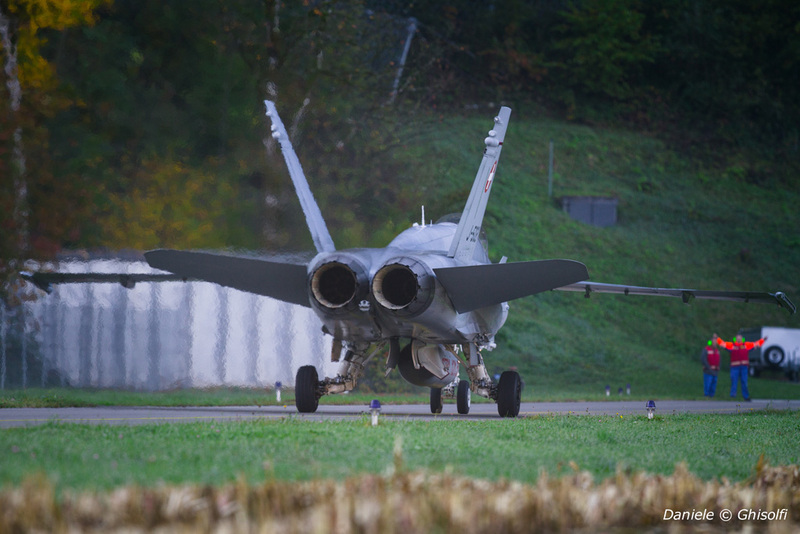 In addition this was the first event after 4 years of cancellation mainly due to bad weather conditions, so, thanks to the full sunny weather forecast, it was a highly expected from the public arrived from all the part of Europe. 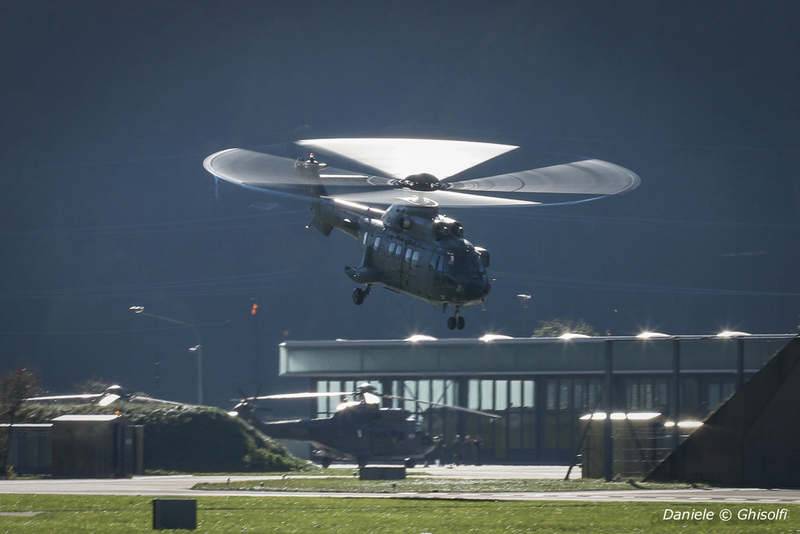 After the first half of the day spent into Meiringen air force base waiting for the transportation reserverved to media representatives and hosts from Swiss air Force, observing the takes off and landings of couples of F/A-18C and many Super Puma and Eurocopter EC635 helicopters involved in the transportation of people and technical equipment, finally at 11:45 took place a brief media meeting where the commander of Swiss air Force Aldo C. Schellenber shows to the journalists the role in the present and the possible future scenario of air force. 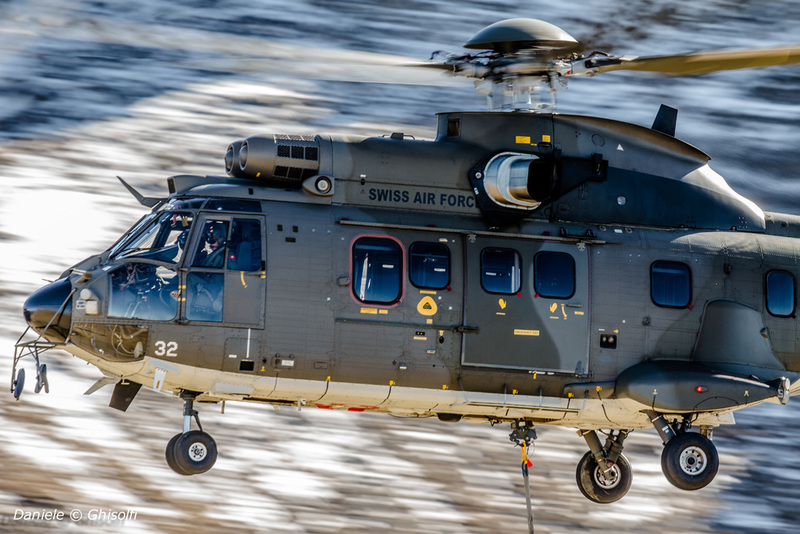 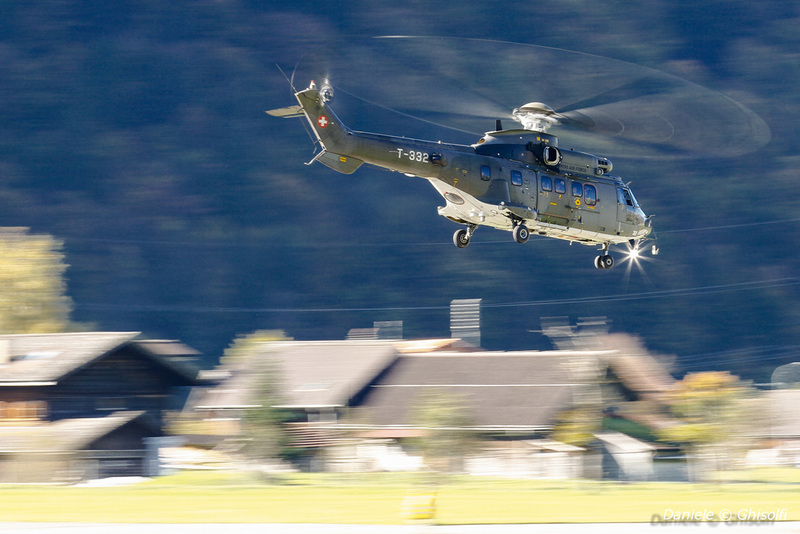 After more or less 30 minutes, finally we get on board of our Super Puma, that after a short flight landed close to the famous small control tower located on the Axalp – Ebenfluh. 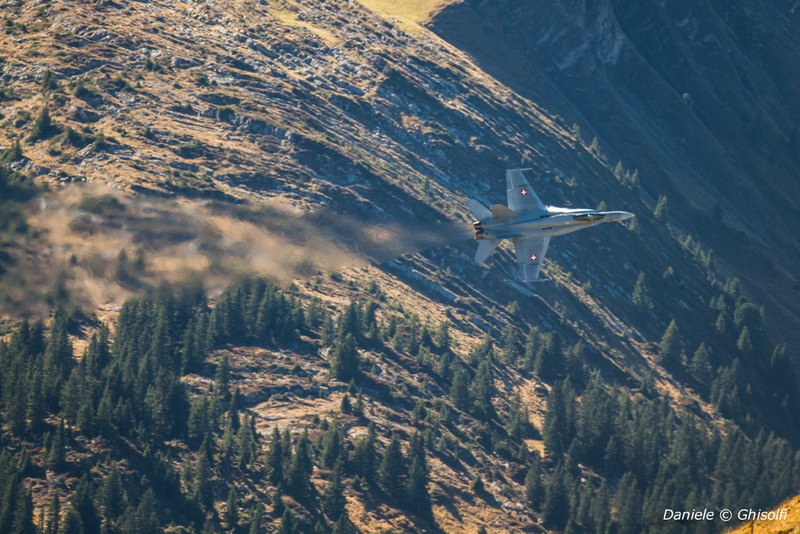 Spectators are already numerous, air force estimated more or less 6000 persons, divided between the Ebenfluh, Tschingel and the most famous Wildgärst peak, reachable in about 4 hours of walking but for sure the most spectacular point of view because overflow by the jets leaving the fire-field. 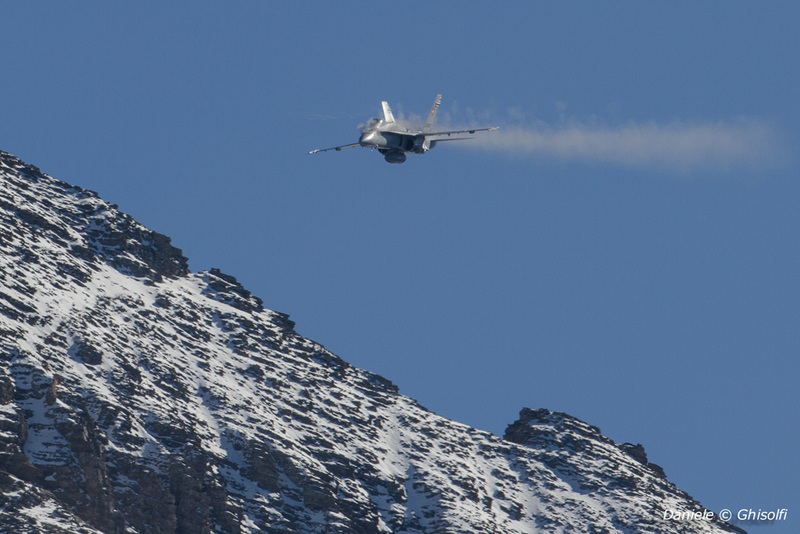 At 14h00 o’clock, a boat resounds in the valley, when two F/A-18 entered the scene with a conspicuous use of flares and disappeared after few seconds behind the snowy peaks. 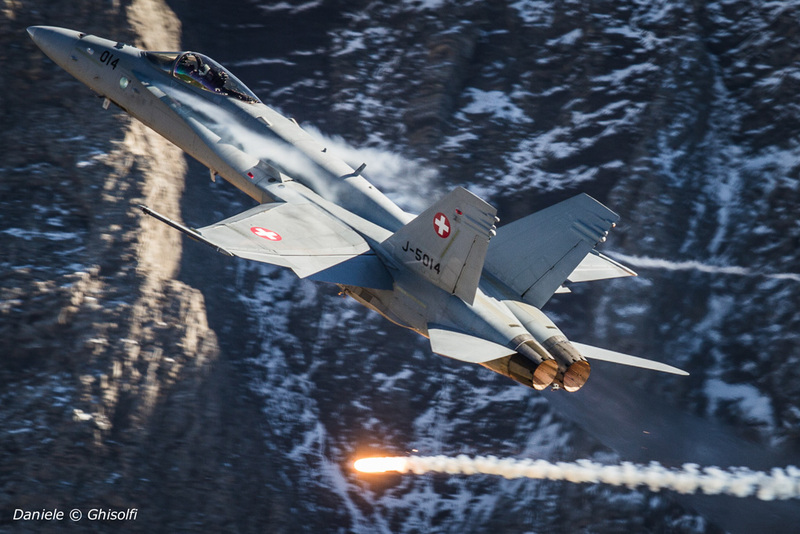 It was the beginning of an alternation between couples of F/A-18 and F-5E arriving from different directions and shooting the orange targets leaving the area performing spectacular maneuvers showing to the presents the high level of swiss fighting pilots. 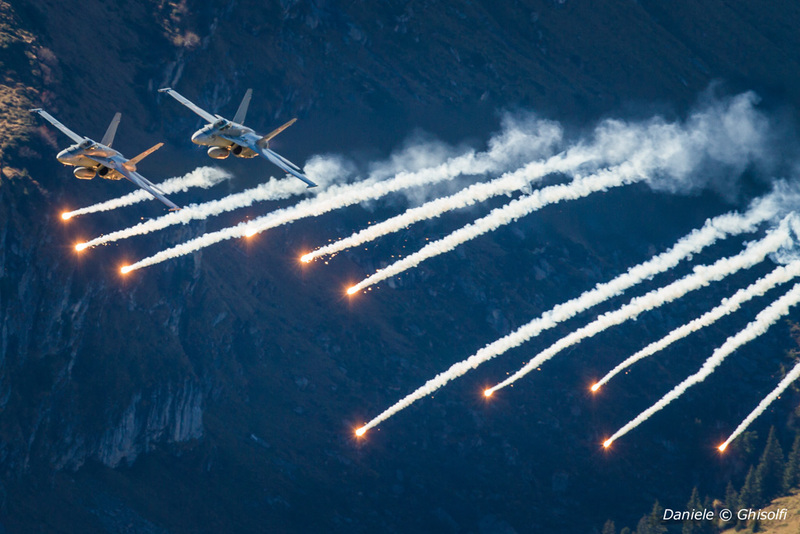 The attacks went on until the final fly past with a huge formation of 4 F/A-18 and 6 F-5E. 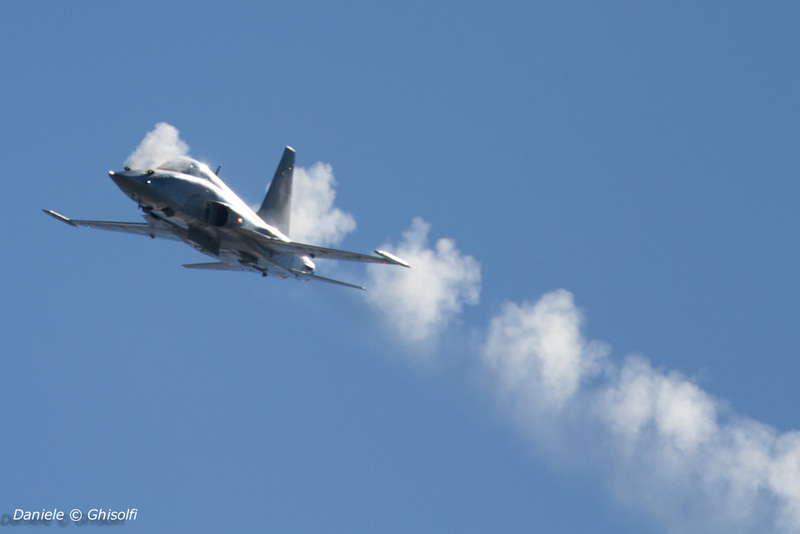 This was the end of the most characteristic part of the show because there are not other air shows where you can see fight jet using their weapons in front of the public. 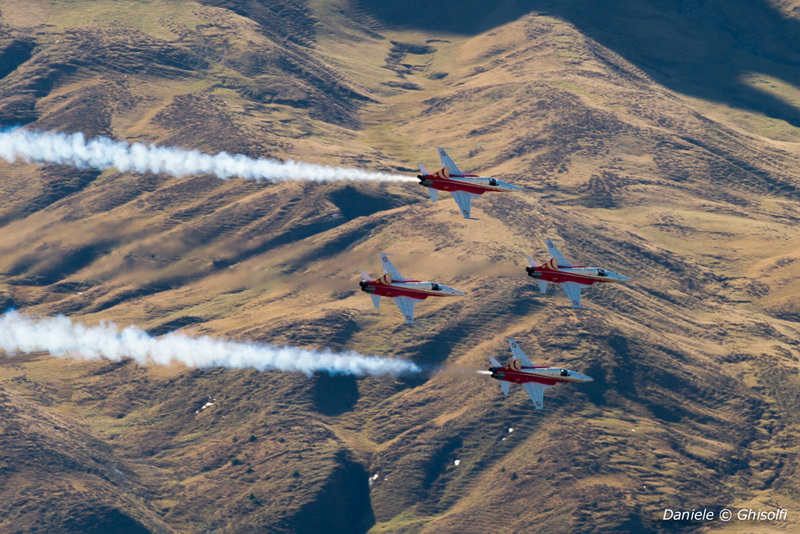 The second part of the event was dedicated to demo team of Schweizer Luftwaffe. 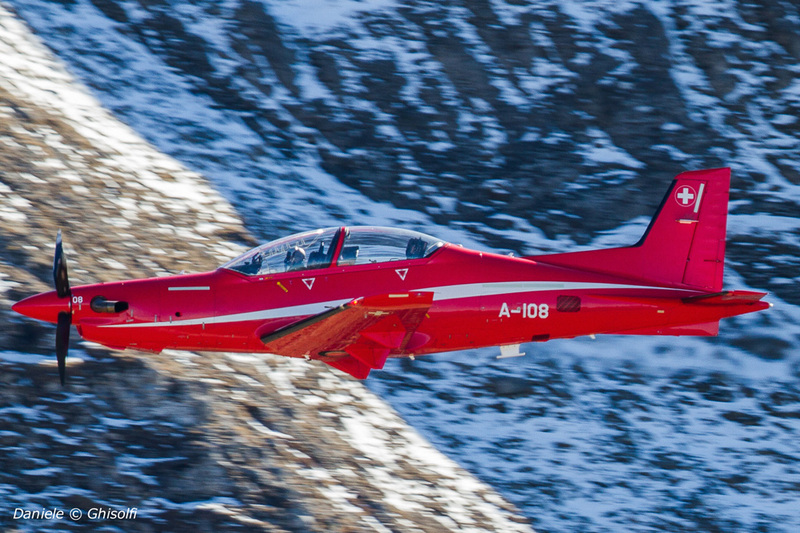 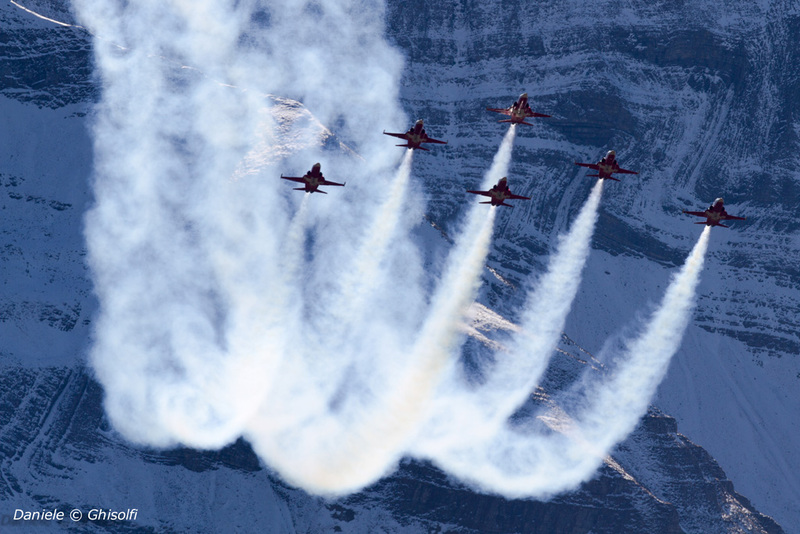 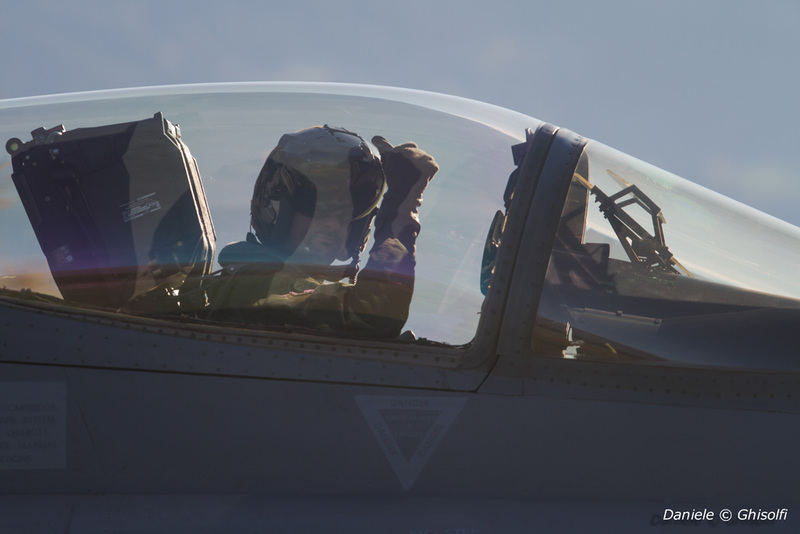 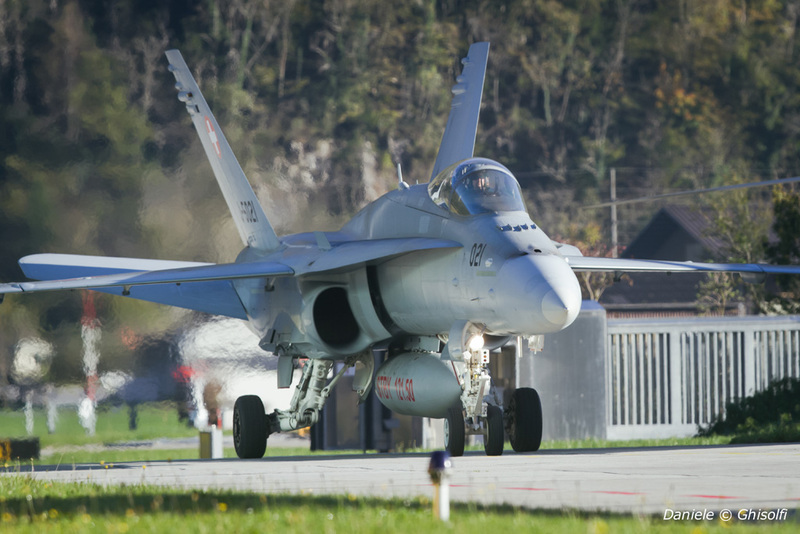 The first to break into the scene was cpt Nicolas «Vincent» Rossier, demo pilot of F/A 18 for the season 2017 followed after some minutes by Lt. Col. Daniel «Stampa» Stämpfli with his the red Pilatus PC-21 who flied fast manouvres at more then 600 km/h, really impressive. 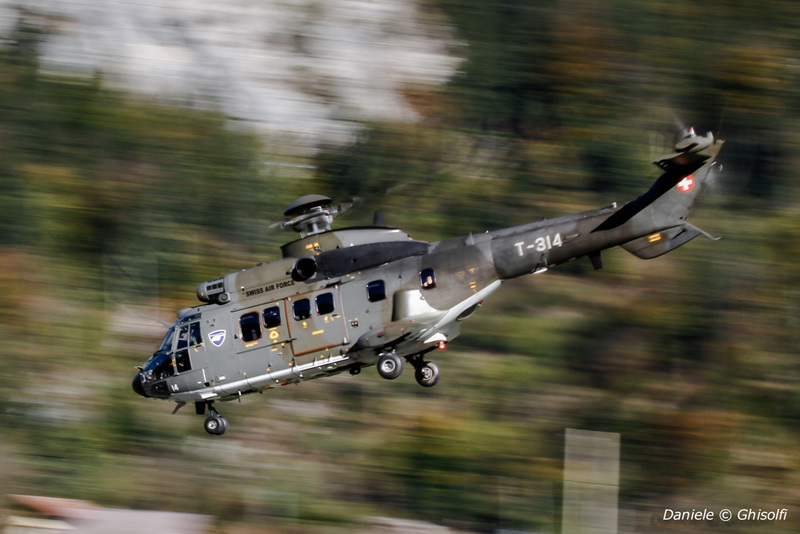 A classic for all Swiss air shows, the Super Puma display. 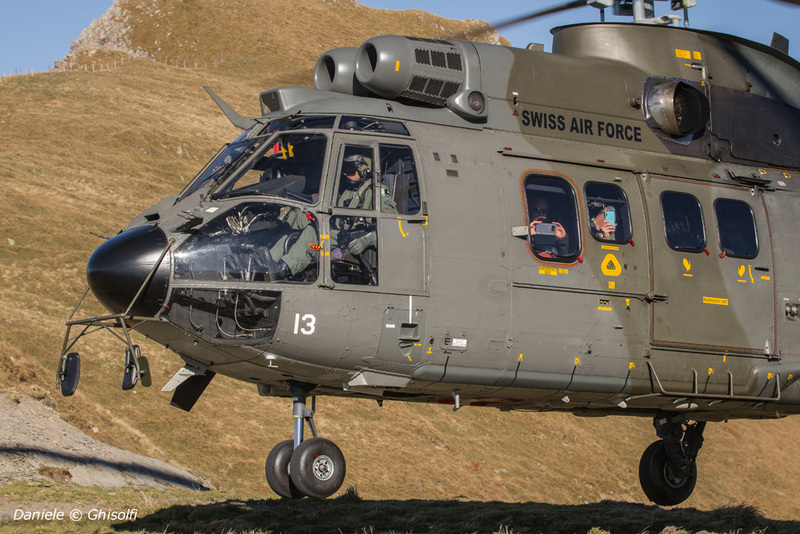 Turns tight, fast passages were used to show the extreme maneuverability of this helicopter in this alpine context. 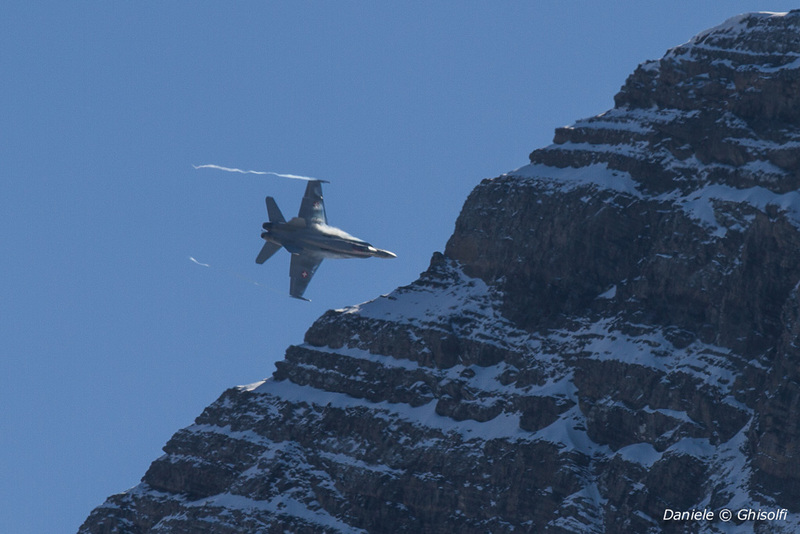 His display ended with one of the most awesome maneuvers of the day. 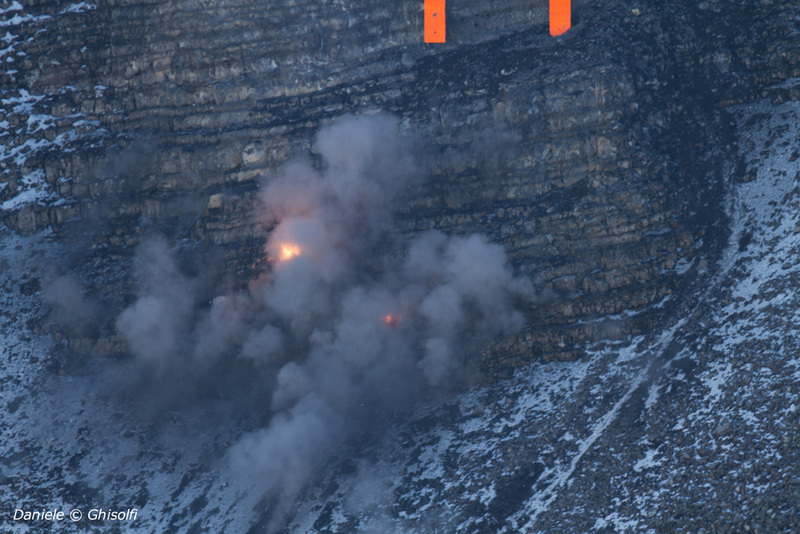 A vertical climb along the ridge of the mountain ended with a turn accompanied by an endless launch of flares that left behind a long white impressive wake. 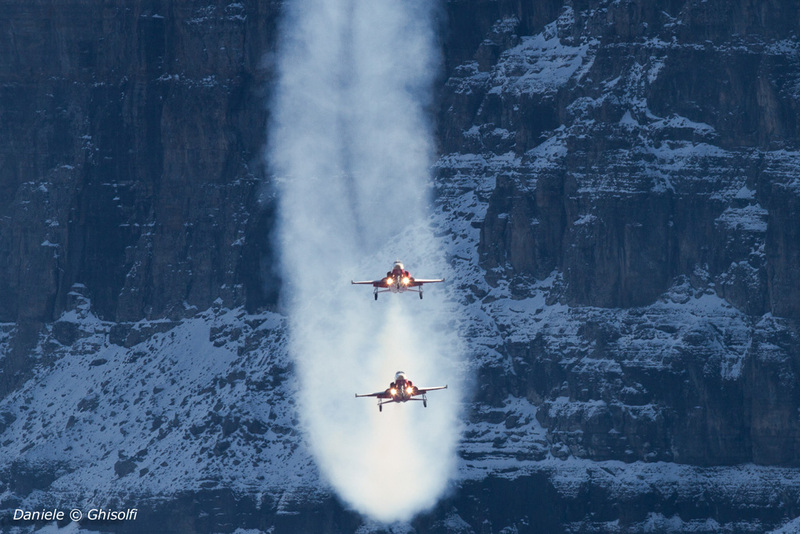 The decibels grew up with the with the display of Patrouille de Suisse that on board of their 5 red and withe F-5 flew with the usual precision their fantastic program which we remember the most important figures as the shadow formation, the mirror formation, the tunnel passage and the grand finale which the 5 tigers open to fancy lighting the sky with the launch of flares. 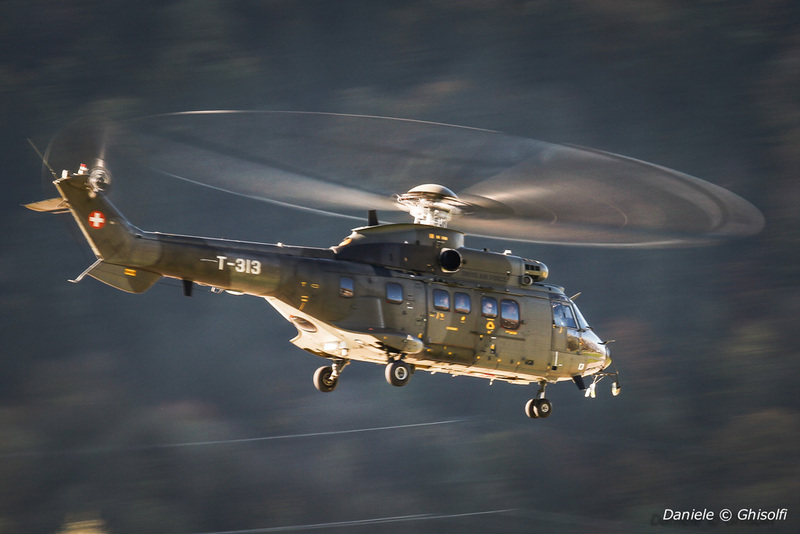 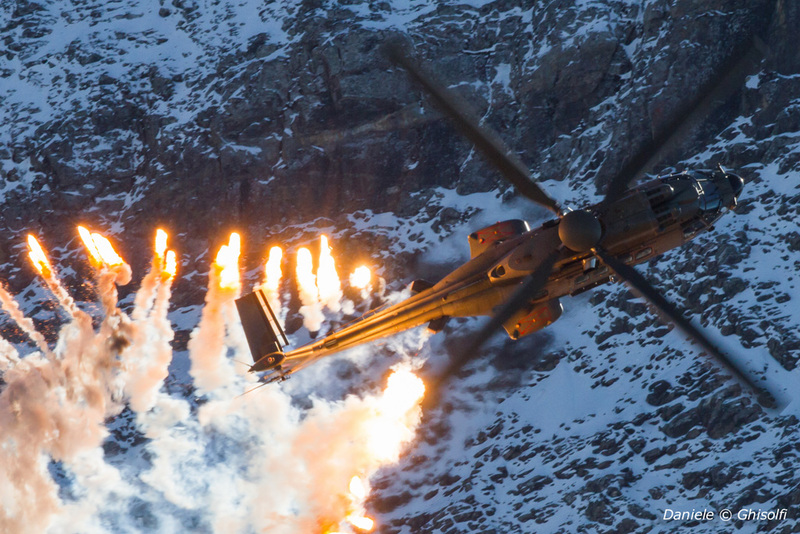 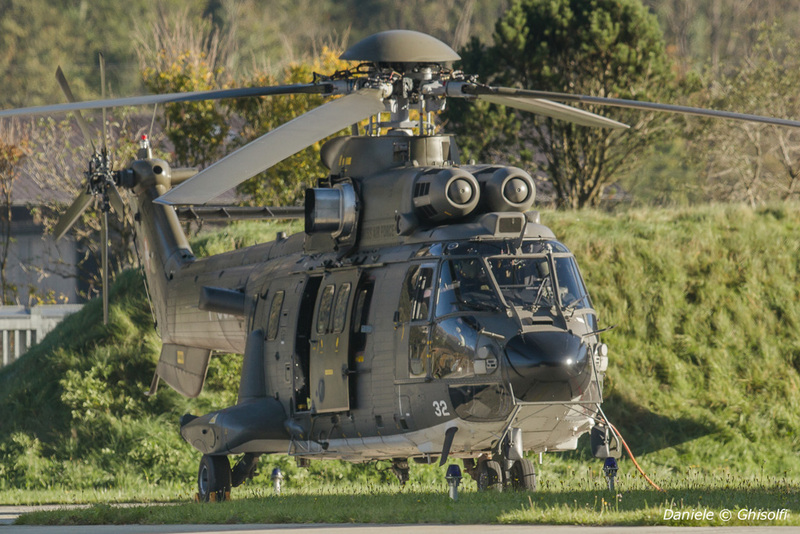 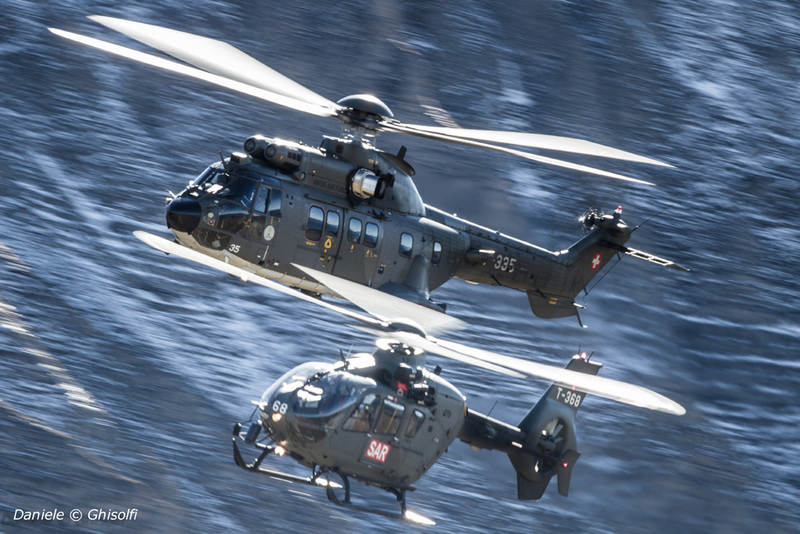 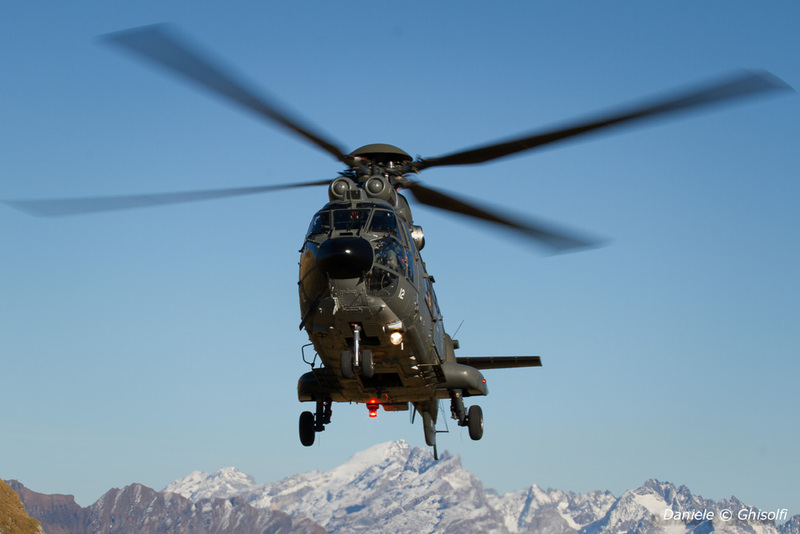 In the third part of the show they performed a formation of two helicopter Puma in a simulation of extinguishing a fire and a launch of paratroopers that passed very close to the public on the Tschingel and continued their flight along the valley. 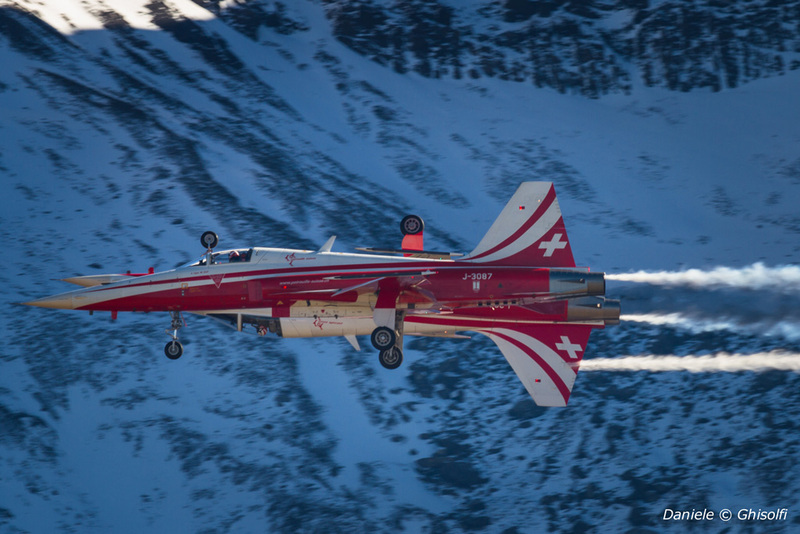 So, we are sure that this of Axalp is one of the events that cannot be missed because there are not other shows comparable to this. 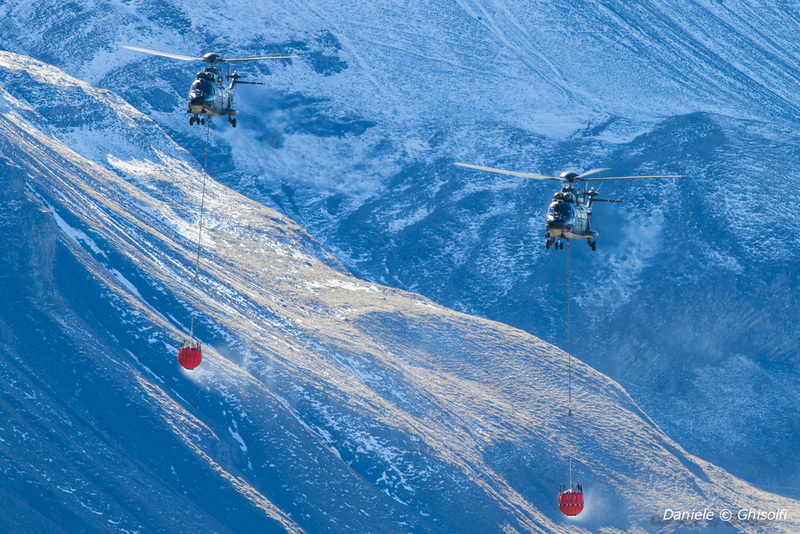 We wish that 2018 will be kind from the point of view of the weather because for sure we will be there to tell you this once again unique event in the world.